I am using PhotoScape version 3.3 for all my photo editing needs. OK, I admit that I use Photoshop time to time. But after I started using PhotoScape, I rarely use Photoshop because PhotoScape is so fast, simple and yet powerful enough for me to use with blogging. 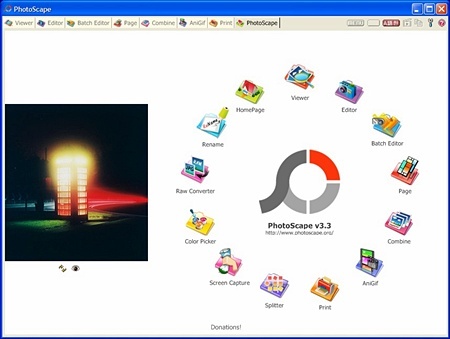 PhotoScape is a graphic editor that helps me edit and fix digital images easily. Probably this is most helpful when adding addtional texts for descriptions onto the screen captured image. I always use PhotoScape to edit images for my blog. There are many features in PhotoScape, but especially I like two functions. Basic graphic editing tool such as resizing , bright, sharpen, auto level, and other effects. You can easily insert texts and icons also draw lines and shapes easily. You can also insert other pictures as object and easily move them just like object in layers of the PhotoShop. There are other tools for digital pictures such as Red Eye remover and Mosaic effect . You can edit multiple files at once. I found it very useful to print the date taken for the hundres’s of the digital pictures before I order the prints. It extracts the information using EXIF data information. Or you can resize or apply specific filtering effect to the multiple pictures at once. Also it has other useful menus such as GIF animation creator , Color Picker, and filename change tool. 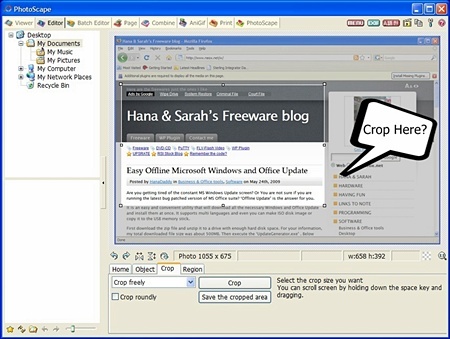 This is a freeware to use in Personal and Commercial purposes. Completely free.